Prostitute: Come home with me. It's warm. You can have it any way you want. You have dollars, don't you? Prostitute: Where do you think we are? It's 1923, and Germany, unable to pay its staggering debts from World War I, is in chaos. French and Belgian troops have taken control of Germany's prime industrial areas, and hyperinflation has set in, with the resultant economic and political turmoil. Abel Rosenberg (David Carradine), a Jewish circus acrobat, has been stranded in Berlin, and spends as much of his time as possible in a state of drunkenness. Returning one evening to his boarding house, he takes a tray of food up to his brother Max, only to find him sprawled on the bed, gun in hand, his brains splattered against the wall. In his only English-language film, Swedish director Ingmar Bergman tells the story of Abel and Manuela (Liv Ullmann), Max's wife. With no one else to turn to, Abel moves in with Eva, and spends his time visiting Eva at the cabaret that she works at and scrambling for money to feed his alcohol habit. But when he's taken in by Police Inspector Bauer (Gert Fr�be), things take a darker turn, as he learns that several of his acquaintances have been murdered in bizarre and grisly ways. And then there's the charming, slightly sinister Hans Vergerus (Heinz Bennett), who tries to renew his old friendship with Abel�but to what end? 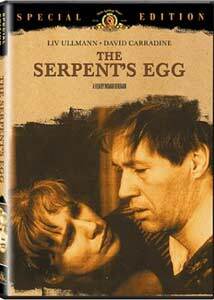 The Serpent's Egg stands out among Bergman films, not for its quality but rather for the circumstances under which it was filmed. Arrested for tax evasion by the Swedish authorities, Bergman had moved to Munich, where he struck up a friendship with producer Dino De Laurentiis and Horst Wendlandt, who became the film's executive producer. With a huge budget, certainly by his standards, Bergman was able to have huge sets built (including a street complete with a tram), increase his crew from the usual ten or fifteen to over one hundred, and hire a Hollywood star. Under these unusual conditions, Bergman and cinematographer Sven Nykvist modified their usual shooting style, and the result is unlike any other film in Bergman's oeuvre. Gone, for the most part, are the penetrating closeups and static camera shots so prominent in most of his other films, replaced here by interior medium and exterior long shots that take in the beautifully detailed sets. Gone is Bergman's insistence that modern life is unbearable and inevitably leads to a sort of spiritual (and usually, physical) breakdown, replaced by a more mechanical depiction of mental instability. And the film, for precisely these reasons, is often looked upon as a "lesser" Bergman film. But, as Bergman biographer Marc Gervais points out in one of the supplements, this lack of appreciation depends as much on one's approach to the film as on the film itself. If it's examined from a neutral standpoint, rather than with any built-in expectations arising from the fact that it's a work by Bergman, there's much to like about the film. The sets and costumes are beautiful, and the lighting (all artificial), as captured by cinematographer Sven Nykvist, is virtually indistinguishable from the natural lighting used in most Bergman films. David Carradine is good in his role as the bitter, confused, almost perpetually-soused Max, and Liv Ullmann impresses as the tender, desperate Manuela. And what an experience it is to see her first scene�on stage at the cabaret where she works, dressed in a tacky, revealing costume, made up with turquoise eye shadow, rouge, bright red lips, and wearing dangling earrings, a jeweled headband, and a green wig! Image Transfer Review: The image is strong, with bright, vibrant colors that allow the cabaret scenes and beautiful sets to shine. Black levels are mostly very good, although a bit gray in a few scenes, and there are occasional problems with grain. But it's an enjoyable transfer to look at, and there's no edge enhancement. Audio Transfer Review: The mono sound is serviceable, and about as good as one could expect from a foreign film of this vintage. Dialogue is at all times clear and understandable, and music comes through well. Extras Review: The 19m:33s Away From Home documentary, in common with the other documentaries in the set, is directed by Greg Carson, and mixes comments by University of Montreal film professor Marc Gervais, clips from the film, new interviews with actors, and yet again, excerpts from a 1970 interview with Bergman that has no connection to the film. David Carradine and Liv Ullmann speak mostly about the historical circumstances around the financing and filming of The Serpent's Egg, and how these influenced the final product. Carradine's remarks are mostly rehashes from his commentary track, but Liv Ullmann contributes an interesting anecdote about watching the film with Bergman a few years earlier. Marc Gervais argues, somewhat convincingly, that The Serpent's Egg is best viewed as Bergman's attempt to make a 1920s German expressionist film, in the 5m:35s German Expressionism. The Photo Gallery contains a Swedish poster, one piece of artwork, and 45 production stills. Of all the discs in MGM's The Ingmar Bergman Collection, this is the most interesting collection of photos, many of which were either staged for promotional purposes or are from scenes not in the final film. The U.S. release trailer is soft and somewhat faded, with speckles and grain, and is a great example of how not to market a Bergman film. In his commentary track, David Carradine discusses how Bergman relates to his actors, compliments Liv Ullmann and Gert Fr�be, and talks about Bergman's personality and outlook. It's a varied and interesting commentary, despite the many gaps. Swedish director Ingmar Bergman's only English-language film features strong performances by David Carradine and Liv Ullmann, in an unusual near-horror film set in 1920s Germany. The tranfer is quite good, and the supplements, including a commentary track by Carradine, are varied and interesting.